Most everyone who visits Yellowstone National Park probably has a story to tell about their time there, be it banal or profound. Whatever your story, many visitors to Yellowstone take heart in the fact that their park story is one of many. Ideally, every visitor comes away with something to say about the park, even if it’s just one of those humorous (and usually wildly off-the-mark) 1-star reviews on Yelp or something. Indeed, the number of Yellowstone stories (ranging from officials accounts to pieces of “historical value” to the numerous diaries and reminiscences that have accumulated over the years) is mind-boggling. As to why there are so many stories, you could spend a lifetime trying to figure it out. Montana author hasn’t spent a lifetime thinking about, but he’s spent a good deal of time on the question, that time that has yielded a fine book about Yellowstone National Park: Wonderlandscape: Yellowstone National Park and the Evolution of an American Cultural Icon. Clayton, a longtime resident of the region, bases his book on a (somewhat) surprising premise: that Yellowstone is first and foremost a cultural entity, not a natural one, better approached through the stories people tell and their registered experiences than through disciplines like geology, ecology, natural history, etc. Which is not to say Clayton doesn’t believe these things matter. Indeed, Clayton admits in the prologue he resisted this conclusion for a long time. Yellowstone’s natural integrity eminently matters, but it doesn’t hold as much weight in Clayton’s analysis. In ways I hadn’t initially expected, the story thus matters not only to people visiting Yellowstone, or living nearby, but also to people who have only vaguely heard of it. The story of Yellowstone is the story of a place gifted with natural wonders and cultural force, and with powerful yet ever-changing ways to harness those gifts for the greater good. It is, in other words, the story of America. It’s a story Americans tell about ourselves, hear about ourselves, and come to see as a description of who and what we are. Many of the stories Clayton treats are probably well-familiar to area residents and serial visitors: the 1871 Hayden Geological Survey, the so-called “Campfire Myth,” the resurgence of bison, Theodore Roosevelt’s 1903 visit, the seminal Craighead studies of grizzly bears and the 1988 fires, among other topics. Granted, Clayton makes detours throughout the book, but they rarely stray from Yellowstone’s “wonderlandscape.” For instance, a discussion of Yogi Bear and Jellystone National Park (and its companion resort franchise, started in Wisconsin in the late 1960s) explicitly ties the cartoon’s shenanigans to a post-WWII Yellowstone, when the park was a primo destination for baby boomers and their parents. And any discussion of Progressive Era politics (featuring figures like Roosevelt and Gifford Pinchot) inevitably circles back to the question of what it meant for Yellowstone. With the excitement of all the wonders that [painter Thomas] Moran and the Hayden party experiences, we sometimes gloss over what they didn’t experience. An abundance of wild animals, for example. The party’s hunters continually returned to camp empty-handed, one member’s diary includes repeated entries such as “squirrel and partridge for dinner as José got no game.” [Photographer William Henry] Jackson later reported that nobody on the expedition even saw a bear the entire summer, which was an exaggeration, but not much of one. Ecologists today are wary of using these anecdotes to say much about actual wildlife populations at the time: maybe this party was simply too large, noisy, unskilled, or unlucky to encounter many animals. But whether animals were absent or just hiding, the notion of abundant wildlife did not register with our heroes. The reasons for thinking of Yellowstone as special all centered on geology. But less than thirty years later, the situation would change. When the once-ubiquitous bison suddenly loomed on the edge of extinction, the nation looked again to Yellowstone—with a very different set of priorities. 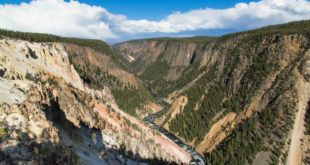 While not exhaustive, Wonderlandscape is a great primer on Yellowstone history and a unique discussion of the park’s place in America, in both physical and cultural geography. Wonderlandscape will be available for purchase Tuesday August 8, 2017.